Staged at the music bunker of the Lower East Side known as drom, Happy Lucky Golden Tofu Panda Dragon Good Time Fun Fun Show is music, sketches, and stand up as performed by Slanty Eyed Mama. Comprised of Kate Rigg and Lyris Hung, this show is effortlessly entertaining. Rigg provides an evening of crude humor, stereotypes, and uproariously comical songs with Hung on electric violin. Though the curation of the evening may not flow perfectly from point A to point B, the fun is at a high throughout. And that's why we're there. Though Rigg jokes that the show is just a friends and family tech press dress, the show is more polished than she thinks. Right now, Rigg's show is very general. It can improve by implementing a stronger through-line. Let there be more than just the referential jokes to tie it all together. Even in a concert setting, it was more than just two seasoned performers. The stage was lined with Chinese food boxes, Hello Kitty, and the Lucky Cat. The ambiance only added to the fun. The projection design by Leda Razorikon Resurreccion enhanced the stories and songs but, intentional or not, watching the cursor call up and start the videos was not appealing at all. 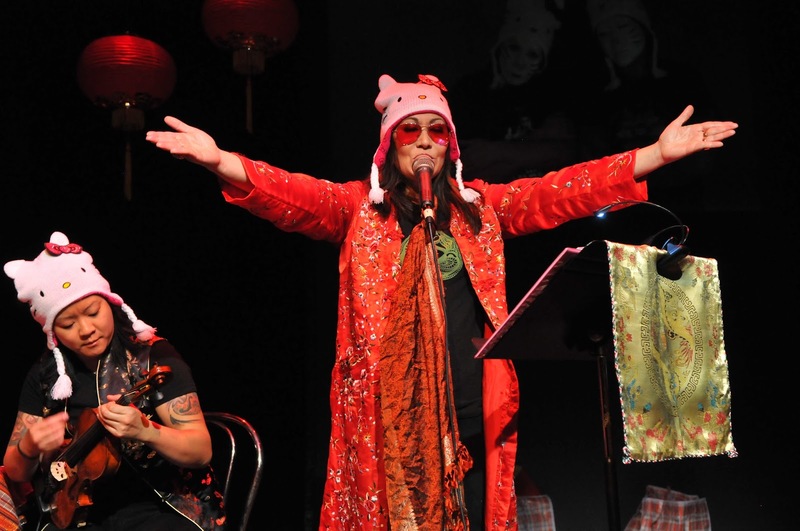 In the end, Happy Lucky Golden Tofu Panda Dragon Good Time Fun Fun Show is pure enjoyment performed by veteran performers. It's guaranteed to make you laugh.